Writing is a skill that has so many applications – it’s no surprise that we’ve featured a lot of freelance writers on The Daily Interview. The ability to write can go a long way for someone who wants to become an internet entrepreneur. 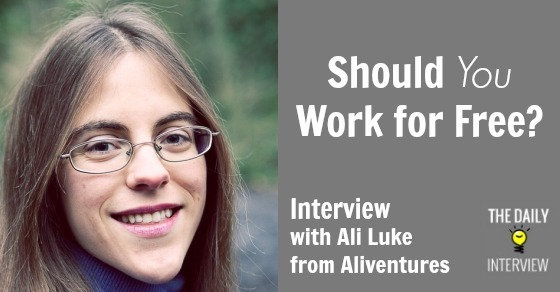 One person who has taken advantage of the ability to write is Ali Luke from Aliventures. She writes for her own sites, for client sites, and has even written for the “For Dummies” series that you’ve probably seen in book stores everywhere. Ali, it’s been really interesting to follow your success as a writer on your blog, Aliventures, and you’ve shared tons of valuable advice for writers and aspiring writers. Tell us a bit about yourself, your journey, and your business – what led to the creation of your business (Aliventures), and what is your business most focused on today? Thanks so much, Eric! When I first created Aliventures — back in 2008 — I was offering “writing and website creation.” Today I know (having learned a bit more about running a business!) that I was casting my net far too wide. I still occasionally set up websites for friends and family, or help out clients with their WordPress blogs, but I’m very much focused on writing now. I’m someone who gets bored quickly, so my business has been through a few different stages over the years. Also, I became a mum last year (my daughter Kitty just turned one year old) so I’ve taken some business decisions to make life a little easier — I don’t offer writing coaching any more, for instance. Right now (early 2014), my time is split fairly evenly between working with clients (usually creating content, which can include ghost writing and editing) and working on more entrepreneurial projects. I’ve got a private teaching / community site for writers at www.writershuddle.com and I’m editor of DailyBlogTips, where I run regular courses on blogging. Becoming editor of DailyBlogTips was a great moment, not just because it’s awesome to edit a blog with 30,000+ readers, but because Daniel Scocco (the owner) was one of the first people to hire me as a writer — before I even quit my day job. I remember writing for his site DailyWritingTips back when it had about 8,000 readers. Today it’s massive! Daniel and I have also worked on a number of projects together over the years in between. Another fantastic moment was getting an email from Wiley asking if I’d like to write a “For Dummies” book. Publishing E-Books For Dummies came out in September 2012, and it’s really exciting to have written a book in a major series with a huge publisher. From an income perspective, Writer’s Huddle has been a great success, as it provides recurring income: I wish I’d started a membership site sooner. It doesn’t take up all that much of my time each month to run it, either. My big challenge currently is finding the time to market it effectively and bring in new members. Lots of people want to be writers – many call themselves writers – but you and I know that’s it an even smaller population that actually focuses, takes action, and writes consistently. From your perspective, what do you think it actually takes to be a successful writer? That may be a loaded question, but what are 2-3 things that an aspiring writer can do right now to move them in the right direction? 1. Write on a regular basis. That doesn’t have to be daily, but it should probably be at least weekly. Ideally, commit to a specific project (like a book or blog). 2. Be open to exploring new directions. When I was at university, my one dream was to be a published novelist, and it wasn’t until I’d left that I became interested in blogging professionally. 3. Meet with other writers. That could be online, but if you can get together with people face-to-face, it really does make a difference. There’s nothing more powerful than being encouraged by people who “get” it. Which do you like more, freelance writing (for others) or writing for yourself (eBooks, blog, etc.)? Which is ultimately the most rewarding (financially and otherwise)? I love both! Freelancing means I know that my work is going to pay off financially, plus I get to work on some really interesting projects with some great people. Working for myself, on the other hand, gives me full control, and allows me to work on extended pieces of content like seminars and e-courses. For anyone who’s struggling to free up time for their own projects, one good way is to raise your client rates! You may find that you lose a little bit of work, but you’ll probably more than make up for this by getting more per hour from your other clients. For someone who is just starting out (i.e. they have no clients, no real writing portfolio, etc.) and wants to become a freelance writer, what advice would you offer? What do you wish someone told you about when you first started? Be willing to work for free to build up your portfolio a bit — and to make sure this really is what you want to do. When I started out, I did a bit of work for a charity who gave me a lovely testimonial. Later on, when I began to offer writing coaching, I did a bit of this for free in order to get feedback and testimonials. I wish someone had told me to set up a separate PayPal account and bank account for the business, so that I didn’t have to sort through all my personal vs business payments and expenses at tax time! Let’s take a step back and look more generally at the business of being an online writer: If you had to take your best advice and put it into one sentence or phrase, what would that be? Software: WordPress. I can’t imagine building a blog or website without it these days. Definitely go with self-hosted if you can (you may want to check out my DailyBlogTips course Get Blogging for help on getting started). Blogs: ProBlogger, Copyblogger, Firepole Marketing and Michael Hyatt are all fantastic blogs covering a range of topics related to online writing, and all coming from slightly different perspectives. My own blog is Aliventures and you can find me on Twitter as @aliventures. I also blog at DailyBlogTips (where I run online courses) and Zen Optimise (where I run in-person blogging / social media courses in the UK). Thanks for taking the time to answer these questions, Ali! What did you think about this interview with Ali? How has working for free helped your business/portfolio? Leave a comment below! Great advice. Writing for free at high quality blogs via guest posting is probably a better way to get started than writing for low rates on content mills and freelance bidding sites, as you are building a portfolio you can use to get paid work.